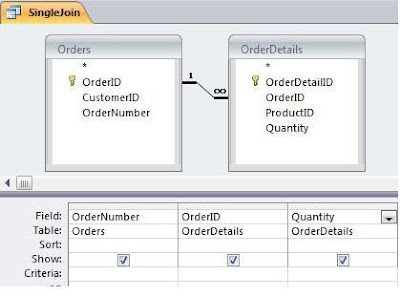 This is part 3 of a multi-part series on the SQL Join. Last time I talked about the most common type of join, the Equi-Join (see: What is a JOIN: Part 2 (Inner Join)). This time, I'm going to talk about the least common join type: the Cartesian or Cross Join. Cartesian Joins are notable mostly for being avoided. A Cartesian Join matches every record in one table to every record in another. Except in very rare instances, this is something to be avoided at all costs. Since it joins all records from both tables, the resultset of a Cartesian join can quickly become huge. A Cartesian join of two tables, each holding a thousand records will result in a query displaying a million records (1000 x 1000). Cross-joining two tables with a hundred thousand records each will exceed the 2GB limit of Access. 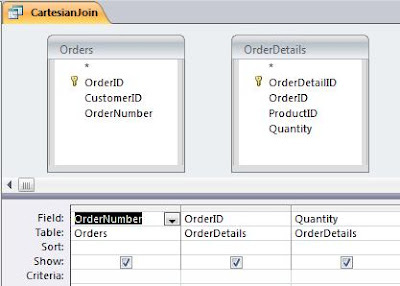 A Cartesian join is most commonly created in the Query Builder by neglecting to add a join line between the tables. As you can see, the information is fairly useless. There is no Join clause between the tables or Join criteria, simply a comma between the tables. But as I said, there are some rare uses for a Cartesian join. One almost trivial use is to add a value to each record of a table. For instance, suppose I have a table called User with one record. Now, of course there are other ways to do this. However, the Cartesian join has the additional property of being non-updateable. If this is a desirable effect, then a Cartesian join can be useful. But the main use of a Cartesian join is in creating joins in the Where clause, which I'll talk about in What is a Join: Part 4 (Equi-Joins in the WHERE Clause) . What Is A Join: Part 1. This time I'm going to talk about the Equi-Join, also called an Inner Join. An equi-join combines records from two tables which have common values in both tables and displays only those with matching records. Since an equi-join is the most common type of join, it is often simply referred to as a Join. 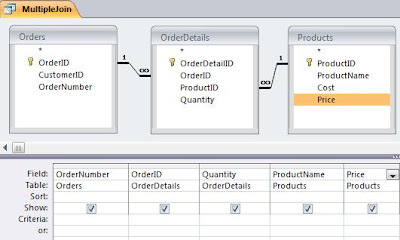 Notice that although the Orders table has a record for Order Number 444, it does not display in Single Join Query. That's because there are no matching records in OrderDetails. An equi-join shows only those records with matching values in both tables. Notice the 1 and infinity symbol (∞) on the Join line. These indicate that a Relationship exists between these tables and that the OrderID is a Primary Key for the table on the "One-side". This is important, because if you want a query with a join of two tables to be updateable, the field or fields on the "one-side" of the join must either be a Primary Key or a Unique Index. I'll talk more about the updateability of queries in a later post. to the above query to get the product and price for the order. Next time, I'll discuss the least common type of join, the Cartesian or Cross Join.